Well, another hot and sunny period characterised our 2014 excavations - in many ways a replica of our 2013 season. The results, as always, answered some questions but created even more. So what can we say in retrospect? Firstly we did not find the water pipe (see below), or one of its couplings. A 4m x 1m trench placed across the line of the feature seen on the geophysics trace, down to a depth of 1.2m, did not reveal either the physical water pipe itself, or any real sign of a foundation trench. A subsequent metal detector scan of the probable line of the pipe produced multiple targets. Some of these did not always match the expected line of the pipe. So this remains a project for future work. A nearby 1m x 1m test pit placed over an area of magnetic disturbance, did not produce any sign of a possible observation post said to be hereabouts. Down in the field to the north of the Brick End cottages, we investigated a moat-like feature. Here we found the western arm of the "moat". This turned out to be a very shallow, small cut, underlain by a thick, black clay lining. The eastern arm of the moat was not found but signs of coprolite digging were everywhere. These revealed greensand lumps and plentiful coprolites themselves. Various cut features, perhaps evidence for processing coprolites, were recorded. A 1m x 1m test pit nearby did not disclose a possible house site shown on early maps. Next we investigated possible house sites in the paddocks near Home Farm, shown here in the photo. One 1m x 1m test pit on a hump was essentially blank but two others in lower ground uncovered amounts of bricks, butchered bones and cobbles. Future work will be needed, possibly involving a larger excavation, to determine the exact nature of this feature. 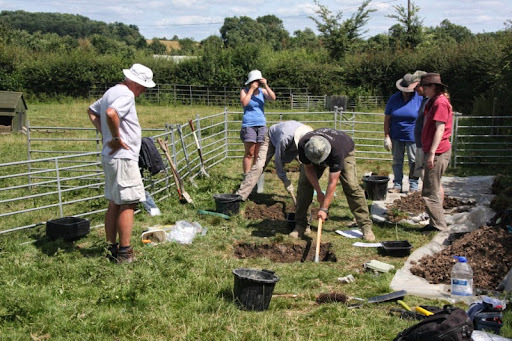 Finally, many thanks to the diggers who sweltered in the hot sun to achieve our excavation plan and also other helpers back at our base tent, who washed finds and talked to an interested public.